Lets face it, our favorite comic strip is often obscure or inconsistent, and key characters are sometimes left stranded for years. Long-suffering readers are within their rights to demand some clarification. Use the "Ask GBT" form to email us your questions, and we will answer those we can on the Blowback page, and also archive the answers here. Would you please post a Flashback of the event Scot and Joanie keep talking about, so that those of us who weren't there or don't remember can judge for ourselves if the Jeb Magruder lecture they attended together constituted a "date" ? We are happy to flash you back to late November, 1973. Whatever the technical nomenclature may be for the excursion in question, both participants clearly had a good time. The brouhaha over this week's series on the Texas ultrasound law takes me back to the 80s when Trudeau satirized a controversial anti-abortion documentary called The Silent Scream. Could you please summon that episode up from the archives? Seems timely. Indeed. The series you refer to -- Silent Scream II: The Prequel -- is the one instance in over 40 years when Trudeau's syndicate decided not to distribute a series of Doonesbury strips. In light of their preference, Trudeau did a different set of strips for the week and Silent Scream II: The Prequel ran in The New Republic. It rejoined its cohort in a subsequent book. You can read the series, originally published in June 1985, here. As we enter the Republican season of Ronald-Reagan-worship overdrive, it would be good to have some Flashbacks to remind us of the nearly unbelievable plot line of the Iran-Contra scandal. Thanks for the timely suggestion. Skipping past, but mentioning, the memorable Contras-in-Miami strips from the summer of 1986 featuring Commander Zero and CIA Agent Havoc, we will pick up the storyline in late November, when the Iran-Contra scandal met daylight, as Rick interviews Chief White House Apologist Pat Buchanan. Note this citation from our Doonesbury Timeline: "January 12, 1987: Readers 'clip 'n' save' pieces of 'the Iranscam puzzle,' hoping Trudeau will complete it. He doesn't. Numerous frustrated readers write in for 'the missing piece.' One woman speculates, 'I think my cat ate it.'" Read the Iran-Contra strips here. Newt Gingrich talking about the child labor laws and proposing that kids work as janitors in their schools struck a Doonesbury chord with me. Didn't Newt have some role in helping Duke set up his orphanage? How quickly we remember. Then-Speaker Gingrich was indeed instrumental in supplying the initial funding for the former Ambassador's "Nothin' But Orphans" project, as chronicled in this 1995 series of strips. I am loving Jeff's book tour, and I recall that a loooong time ago Zeke went on one as well. Could we please have a reprise of that? Duke's prolonged MIA status after parachuting into Iran on a secret mission for Universal Petroleum led to him being declared legally dead. After accidentally burning down Duke's estate and being left out of his will, caretaker Zeke Brenner was inspired to author a biography of the former Ambassador. The publication of Duke: Portrait of a Mentor was chronicled in this 1980 series. In the 10/13/11 strip, Alex's interaction with Siri on her new iPhone reminds me of Mike's somewhat less successful experiences with his new Apple Newton. Can we see a pointer to those old strips? They were great. In the wake of Steve Jobs' passing it's a pleasure to revisit the strip's 1993 "egg freckles" series, as well as a 1995 New York Times follow-up story which explains how "what was once intended as nonsense became a bit of computer history." 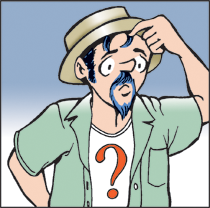 In the 9/11 anniversary Sunday strip Zonker seemed surprised to know that B.D. had been at Ground Zero. I thought he visited him there, no? Yes! Zonk certainly knew B.D. had been on the pile; the revelation was that he had been suffering sleepless nights over what he saw there ever since. Here are several weeks of Ground Zero strips from 2001, culminating in the memorable image that graced the cover of Peace Out, Dawg! This week's storyline about Trff crashing with Duke for 134 days reminded me of the time Zonker, in his trippy wig, overstayed his welcome at a castle in England. Can we revisit please? Indeed, Duke is not the only Duke to have had his hospitality taken advantage of. We are pleased to revisit Lord Z's four-month residency in Scotland, as painfully chronicled in this 1988 series. Hey, seeing Jim "Obscene Profits" Andrews sure takes me back. Can we please get a Flashback of Andrews and Duke plotting to free the Iranian hostages? I seem to remember Duke saying "I see you've got a phone and everything." Thanks! You're welcome. We are happy to flash you back to the summer of 1979, and the planning of the operation that led to Duke becoming known as "the 53rd hostage." I enjoyed Zonker's line about Linus today. A long time ago there was another Schulz reference in the strip, with Snoopy's doghouse. Can you please dig that up? With pleasure. The Peanuts shout-out you are thinking of appeared on January 9, 1997. Enjoy.